LOUISIANA – The news from Louisiana is often hurricanes, burst levees and the dangerous streets of New Orleans. A few years ago, on our first trip through the Bayou State, the weather turned cold. We became stranded in the town of Natchitoches, blindsided by a gale of sleet. Thrilled locals informed us they hadn’t seen snow in NAK-a-tish (that’s how it’s pronounced) for nine years. As polite Canadians, we controlled our elation. As luck would have it, we had arrived the day of the annual river-barge parade. We mingled with happy revellers on the banks of the Red River. 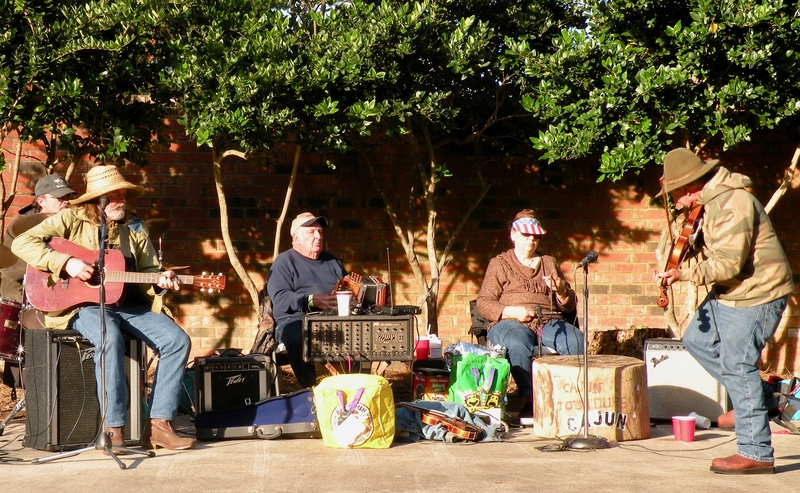 As we strolled, the sound of a Cajun band spilled from an antebellum mansion fronting Front Street. The owner, a well-dressed southern gentleman, was watching the parade through his wrought-iron fence. Small talk ensued. Soon the wandering Canadians were invited into a stately pre-Civil War home to join a bonne fête. The party lasted into the wee hours. Filet gumbo, stomping feet, a crackling fire and genuine Louisiana friendliness kept us warm. After much cajoling, I joined the band, rang the Cajun ti-fer … and did credit to all Canadians – in the beverage consumption department. 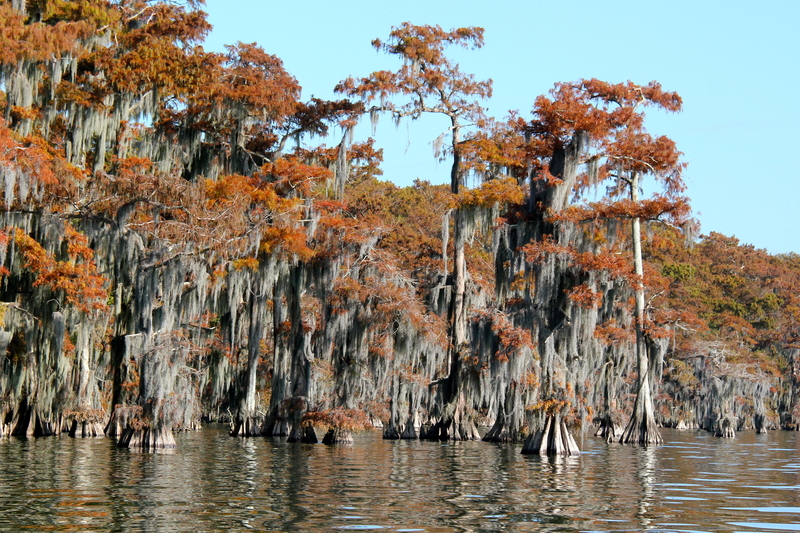 On our return to Louisiana this time, we bypassed Natchitoches, hugging the Gulf Coast, seeking the blue bayou of the South. Roadside billboards stuck in the swamp advertised free consultation to shrimpers still affected by the Deepwater Horizon disaster. The ex-lawyer in me was intrigued. The guy seeking quiet solitude was … quietly disgusted. The bayous of Louisiana start where the Mississippi River begins to end: in the silted course of its enormous delta. Braided channels open and close. New rivers form. Shallow, meandering creeks emerge in swamps overgrown with cypress and mangrove forests. These muddy backwaters are the birthplace for a vast array of aquatic life. Their predators – birds and reptiles – lurk quietly in the sultry stagnant shadows. When we arrived at the Morgan City campground, it was dark. We were hungry, tired, irritable – and without a reservation. Most horrible camping experiences begin with a late arrival. While attempting to set up in the dark, I backed into the last open site, glancing off an oak tree and a concrete picnic table, fanning the fires of a simmering matrimonial dispute. I told him Alberta, and said we were hungry and hoping to find a Cajun restaurant nearby. He recommended a place in town down by the Riverwalk and wished us a pleasant evening. The small group settled around B12’s fire was well into their cups and still going strong. My relaxed demeanour confirmed we had not been led gastronomically astray. “How come he talk so funny?” asked Zach, Vicky’s precocious 12-year-old. I reached into my pocket and handed Zach a blue five-dollar bill. I proudly told him it was worth almost $4 American and that it was now his. “I live only a little more than 50 mile from here, up near Thibodeau, in Lafourche Parish.” Unlike the other 49 states of the union, which have counties, Louisiana is divided into parishes – further tribute to its French roots. We’d had a few brewskies by then – and I don’t put a lot of stock in late-night campfire bravado. So when I popped my head out of the camper the next morning, my expectations for a bayou experience weren’t high. “There you are,” shouted Dean, wiping down the lovely flat-bottomed craft that had appeared at his site. He’d driven 80 km to his home, breakfasted with his daddy, hitched up the boat and returned – all while I was still sawing logs. Vicky, Zach, my wife Florence and I jumped into the boat and Dean motored us into the bayou. The perspective from water was entirely different from the bits of swamp we could see while driving. Narrow, muddy channels serpentined every which way and within minutes, I was completely lost in a vast wet labyrinth. The gators were out, sunning on logs or floating motionless, eyes protruding silently above the water. These malevolent-looking reptiles can grow to four metres and 400 kg – top of the food chain in these hidden warrens. In the bayou, it’d be easy to dispose of things unwanted. I was glad Dean was a friendly chap. After a meal of fried catfish and white beans, and an afternoon of great camaraderie, Dean steered us out of the bayou, effortlessly retracing our path through the indiscernible twisting, turning channels. The sun, shining through a thick canopy of cypress and mangrove, hinted vaguely at our direction of travel. At the dock, we shook hands with Dean and Vicky, said goodbye and climbed into our RV, headed for New Orleans. As we pulled away, Zach strolled up. I rolled down the window. If there’s one thing I can’t stand, it’s a know-it-all kid. I thanked him for his advice and drove off. Less than 100 km down the road, a yellow warning light flashed on the dash. I pulled over. The owner’s manual indicated there was a malfunction in something called the DEF. The problem required immediate attention. After 20 ignition starts, the vehicle would be rendered inoperable. I stopped at an Auto Zone and explained my problem to the man behind the counter. Gerry Feehan, QC, is a retired lawyer, avid traveller and photographer. He and his wife Florence live in Red Deer, Alta.